Are the BBHS coatings easy to clean? Do the coatings have a life comparable to your dielectric coatings? Do the coatings degrade over time and at what rate? 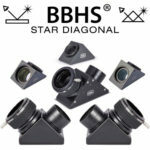 Is there a difference in performance between your dielectric diagonal and the BBHS one, what are the differences and are they significant or very slight? I own an early Televue APO 4 inch refractor. BBHS-mirror coatings require the same care during cleaning as you would give to the protected aluminum-coatings of a Newtonian telescope. Only dielectric coatings have the ultimate hardness to withstand any kind of mistreatment during a cleaning procedure - very similar to our Phantom-Group hard antireflection coatings applied onto our lens surfaces. Any reflecting telescope with classic coatings can attain a lifetime of 20 or 30 years - correct handling provided. The same accounts for our protected silver-coatings, whereas the position of a stardiagonal within the optical train does provide much better protection against environmental influences, compared to the exposed surface of a primary telescope mirror. We do regard the benefit of the BBHS hardsilver coating to be quite noticeable, compared to the reduced spectral range offered by a dielectric coating. Please check in the Internet for statements that would verify our position. Or look for the very extensive tests on star diagonals, performed by William Paolini (see tab "Downloads". In regards to this style of diagonal, please clarify T-2 fitting?.. Are the threads (standard) for say a 2inch telescope eyepiece that could directly attach to this unit from the bottom barrel of it? Yes or no? .if not what is the diameter/threading of a T-2 fitting? T-2 means 42mm thread. The mirror has a T-2 outer thread on one side and an inner thread on the other side. These threads are not standard for 2" eyepiece barrels. It is only possible to attach 2" eyepieces by mounting a 2" eyepiece clamp on the mirror. Unfortunately the mirror is not big enough for completely illuminating the field of large 2" eyepieces, for this you should choose the 2" version of the mirror.